Welcome to the latest installment of Phone-A-Friend. Today we're traveling to another living room! We love living rooms and could talk about them all day long, but wanted to let you know that we have a great fashion accessories Phone-A-Friend coming up next! So worry not if you don't have a living room question, please feel free to Phone-A-Friend us with anything. "What should I have for lunch?" is acceptable! I'm curious what you think about my idea for my living/family room. We have a space off our kitchen that isn't our main TV-watching/hang out space. We mostly use it when one person is cooking dinner. As you can see, we haven't really done anything with the space. It's totally boring and not inviting. Old, bland furniture with no style. We did, however, buy the most expensive cat scratcher (look how Oliver destroyed the couch! I was never happy with the yellow color anyway). We need something new, and we're thinking...a 4 arm-chair conversation area around a circular coffee table! Is this crazy? Is 4 chairs too many? Do they all need to be the same color/kind? Have you seen this anywhere? I'm having trouble finding inspiration. Our style is "transitional" (I learned this on HGTV, traditional meets contemporary), and I like eclectic style, but Scott is less adventurous, haha. Tell me if I'm crazy! To Laura we say: Not crazy... genius! We think this is a great idea for this space! We picture that this type of set up will work very well for entertaining guests while you finish preparing a meal. This is the perfect space for one of you to unwind while the other cooks dinner. Or even better, it could be the perfect place for board games! A dedicated Bananagrams spot... now that's what we are talking about! In terms of whether or not the chairs match, this may sound really weird coming from us, but we think they should. You know, our typical style is for nothing to exactly match, but we think it might be hard to mix up the chair styles and fabrics and create a cohesive look if they don't match. Even though it pains us to say so! You can achieve personality and some fun and eclectic notes using throw pillows on each chair (they definitely shouldn't match!) and accessories. Dishes for appetizers, etc: CB2. Chair: West Elm. We chose this b/c this looks like a color used in other rooms on the same floor, so it was a way to pull the rooms together. This is pricey, but its a classic shape that a lot of stores carry. Tray that doubles as coaster holder: Uncommon Goods. Round Coffee Table: Crate and Barrel. This works because its less bulky than the chairs, a hard surface which is good for board games, and brings in another material (wood) to balance all that upholstery with the four chairs. Rug: West Elm. We know you have carpeting in there, but this would be a great way to layer and to link the chairs and the table together as a sectioned off area. It also brings a pattern in. Orange Table: CB2. This could be used as an occasional table...maybe for the corner next to the window (near the bookcase). We're thinking this could add a great pop of color and have a plethora of uses: as a bar area, to hold appetizers at a party, to hold a small lamp, etc! Console Table: Crate and Barrel. This is a bonus table that could be used under the TV to anchor it a bit and provide more surfaces without adding any more weight to the room since its so airy! Hope this helps, Laura, and let us know how it all works out! Laura laura - my heart started thumping when you said four armchairs around a coffee table - ooh la la, that is carrie bradshaws set up, remember?? her new apartment - the re-done one in SATC 1. 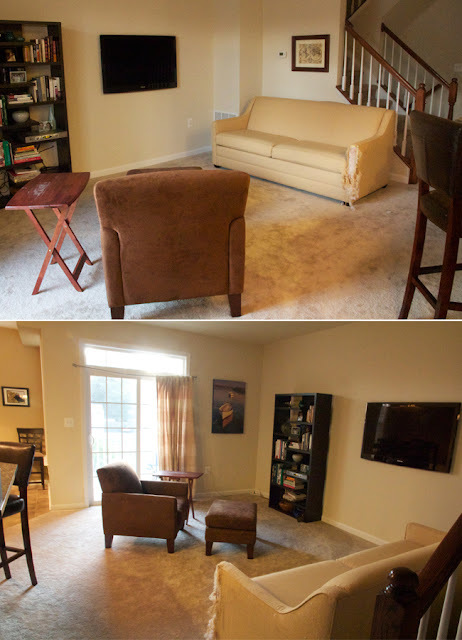 Check it here (she actually uses two bench/love seats and one armchair). I was going to do this very thing in a little room I have until baby entered picture.